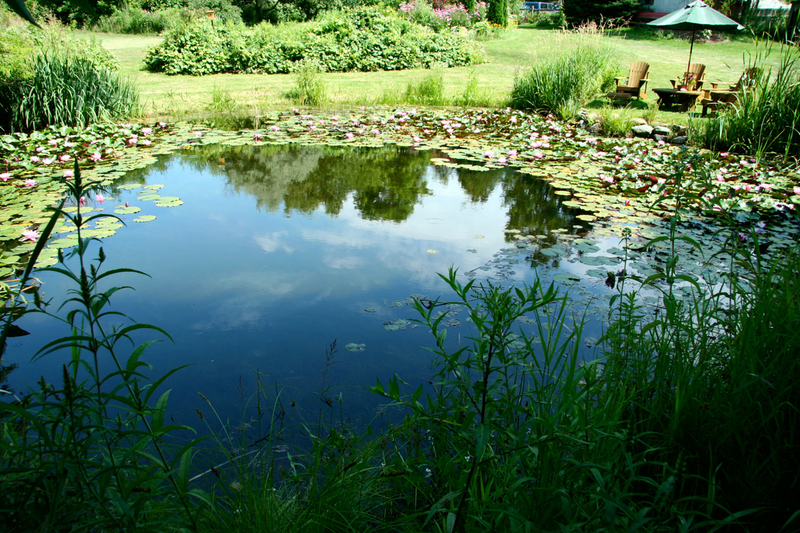 Our pond is small, compared to those on nearby country properties, maybe fifty feet in diameter. Basically it’s a frog pond only five feet deep in the middle, a third of its depth the primordial muck that incubates dragonfly nymphs and mosquito larvae. Twenty years ago, a back-hoe pulled down a slimy cement pool that filled this corner of our acre lot. Gravelly dirt was dumped in the hole to make a ball field for our children; but spring water and cattails reclaimed this hollow as a mating pool for toads and frogs. So, five years later, another back-hoe dug a new pond and my husband, Ed, spent the rest of the summer shaping its edges and bordering a small grassy ledge with rocks for our chairs and umbrella. At first, we envisioned deep water with sunfish and perch swimming the bottom and a profusion of ferns and water plants ringing the shoreline. When we planted marsh marigolds, blue flag, and an elder bush in choice spots, native jewelweed, boneset, and Joe Pye weed picked their own places in the boggy parts. 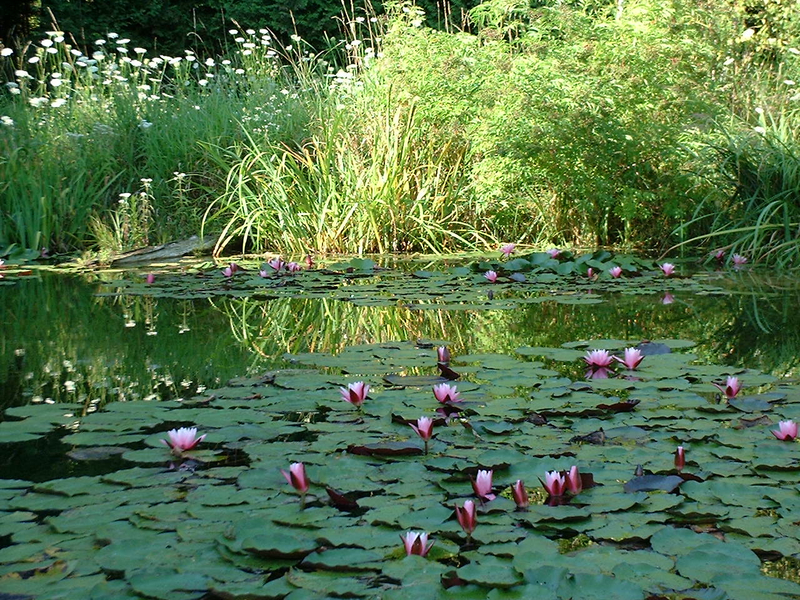 When we lodged white and pink water lilies in the middle of the pond, pickerelweed and arrowhead surrounded them and stood erect like commas on opposite shores. Then cattails repossessed the outlets, and uninvited grasses and goldenrod crowded out the turtlehead and cardinal flower. Tough roots of yellow irises, once thought beautiful, grabbed a toehold on as much shoreline as possible, and proliferated into an invincible foe. Gradually, our vision of an artistic landscape of ferns and wetland wildflowers was replaced by a grudging appreciation of both the alien and native plants thriving in the clay soil around our pond. For amid unruly weeds, we glimpsed tiny blue spots of water forget-me-nots and white sprinklings of bedstraw. Next to the rocks we identified bristly nut grass and pink, trailing smartweed, all modest flora offering unique shapes and colour if we but noticed their unobtrusive presence. After a few years, we conceded that the natural world had its own agenda best left to observe rather than manipulate. When we paid attention, small manifestations revealed themselves, some humorous, some profound, most ephemeral, but all unexpected revelations to be marveled at from the confines of our Algonquin chairs under a green umbrella. Every mid-April along the margins of the pond, the invisible peeper frogs herald the opening act of the Nocturnal Mating and Territorial Squabbling Season. Soon the elongated trills of the toads, like fingernails on a comb, join this amphibious musical. As the weather warms, the high-pitched tremolo of elusive tree frogs moves from wood to water. Finally in early June, when the shrill calls of the peepers fade away, green frogs add their rubber-band twang to the choir. Occasionally, the rapid, hollow notes of a solitary leopard frog resonate as he seeks a mate in waters that are as busy as a Roman bath in the dark. Come mornings, all is quiet. But along the shore lie jelly masses of frogspawn and, twined around the lily pads, strings of toad eggs whose black dots evolve, if not eaten by predators, into hundreds of tadpoles wriggling in the warm water of the edges. A month later on the day of metamorphosis the border grass vibrates when innumerable brown toads, smaller than pennies, hop towards the grape arbour and out into the wide world of the yard. During this coupling tumult, spontaneous Frog Wars erupt as green frogs vie for footage along the shoreline. One low croak begins the challenge. A dozen twangs of varying pitches echo around the pond. Like sumo wrestlers, frogs grab opponents and tumble in the shallows. Moments later, losers concede defeat and retreat to prior-claimed territory. Then another couple takes the stage and repeats this performance to the delight of its human audience. These acts of macho-mating recur well into June, when the weary actors disperse to drier parts of the garden and fatten up for winter’s long sleep. With summer’s approach, the air above the pond’s surface pulsates with the darting zigzags of dragonflies and damselflies. Two-Spot, Nine-Spot, Common Whitetail Red-veined Darter, and Green Darner. After spending most of their lives underwater as ghostly nymphs, they stealthily crawl up spiky reeds, breathe the night air, and shed their larval skins which stick to plant stems like transparent clothes on a line. These ancient insects patrol the pond and devour mosquitoes, midges, flies, always attacking their prey from below. On sunny days, the air close to the pond’s edge dances with the unabashed coupling of Blue Ringtails riding tandem. Over and over, these slender acrobats form circles and hearts before the female deftly deposits her eggs on reeds below the water’s surface. In late summer, as the air cools, Rubyspots rest on rocks, chairs, arms, anyplace warm, and then resume their last minute pairing before an autumn frost ends their brief lives. These breeding rituals fascinate us. One day, we watched the non-stop labour of a Green Darner gliding from stem to stem, never resting in her rhythmic exertion to reproduce another generation before the sun sank behind the cedars. Suddenly, from under a lily pad, a green frog leapt up and swallowed her in one gulp. Only our stunned silence witnessed her transformation from sustainer to sustenance in this peculiar dance of death and rebirth. One moment a dragonfly laying eggs, the next moment nutrients being rearranged into amphibious cells…premonitions of our own dust to dust mortality. In my dictionary, the verb “observe” means to watch carefully, to witness, to watch without taking part. Silently, from the confines of my chair, I behold the nuanced life of the obscure—tadpoles, minnows, damsel flies—all creatures indistinguishable from another, all alive for one long moment of a season, seemingly to flicker in their beauty and then to feed the turtles, birds, frogs, toads – creatures of a higher order that emerge on logs, branches, and margins of the pond, all alive in their splendor for a few more seasons. To my ear “observe” sounds much like “absorb” which is to soak up or incorporate something into a larger entity in a way that loses much of its own identity. A memoir breathes as if alive when it includes the living land. What part of the land or sea where you live would you include in a memoir? ← Who is Your Audience? I would include walks in Presquile Park and nature observations from a time once spent gardening. Deborah, specific details about walks and gardening would be fun to recollect and would pull your readers in. You have a photographer’s eye, so I know the writing will be rich. When I hear or read your words Marie, the cells of my own being zing together with appreciation and the musical stringing of your use of language brings a combination of joy, calm, and the aliveness of nature painted with words. I’m with you, Deborah! Her nature descriptions are exquisite.